The sari has a long history in India. The first depictions of sari like costumes can be seen in sculptures dating back to 100 b.c. 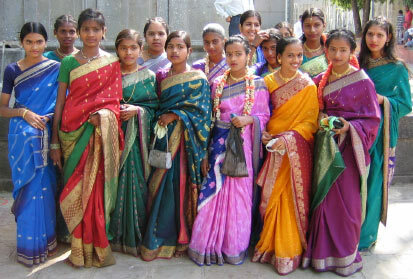 The variety of colors, patterns, weaves and draping styles make the sari one of the world's most fascinating costumes. Hundreds of regional weaving centers are still engaged in traditional handloom production. Today in India six and a half milion people are engaged in the production of handloom sarees. The sari is an unstitched length of cloth measuring 42 - 49" wide and 5.5 to 9 yards in length. Ornamental borders and a matching end piece, called the pallu or anchal surround the field of the sari, which can also be either richly ornamented or plain. Saris often come with a matching piece of cloth for the choli, or tight fitting cropped blouse, either woven on the end or the beggining of the sari, or on a separate piece altogether. Some ultra transparent sarees come with a piece of denser cloth dyed or embellished to match. This piece is usually about 3/4 to 1 meter long. The borders are used for the sleeves and back hem of the choli. This photo by Kate Maxfield perfectly demonstrates the allure of the sari, just in terms of its sheer expressive magnitude. Here these very young girls are wearing their Kanchipuram silk style pieces. The sari is worn with an underskirt and tight fitted top called a choli. The undergarments were not oft worn in antiquity - but became the fashion requirement under the influence of Victorian English ideas in the 19th century. Tribal and village women today are still wearing their sarees the natural and comfortable way. You can see some of these drapes in the Gallery of Sari Drapes. The sari is also worn with a petticoat or underskirt - it serves as a waistband to tuck the upper edge and pleats into and as a slip to prevent see through. 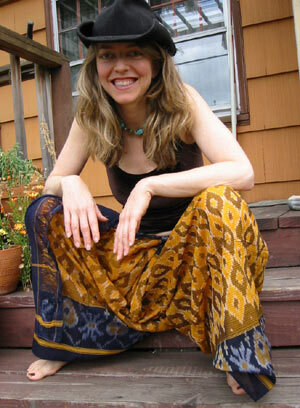 Jennie on the porch with a tanktop and a kaccha wrapped ikat cotton sari. How you wear your sari is up to you! The sari doesn't have to be worn with a choli or a petticoat. A tight fitting top of any kind can be worn under the sari, and it's possible to drape the sari by first drawing the top border around your waist and tying a knot to form the waistband. There really are no limits with this simple, yet infinitely adaptible garb. The sari can be draped in hundreds of different ways - as many as your imagination can manifest. The sari is a doorway to a profound understanding about drape, about the geometry of your body as it interfaces with cloth. And a source of inspiration for design. Buy Chantal Boulanger's book exploring all the different varieties of drapes and try wrapping them - you'll be even more smitten. Wearing a sari changes the way you feel about your body and clothes, and about your idea of clothing in general. You can browse an overview of sari styles available in the sarishop. All sarees in the sarishop are organized by regional weave or dye/print style. The Silk Sarees of Tamil Nadu is a wonderful book exploring the region's heritage of silk sari weaving. It is a fascinating, behind the scenes look at the life and lore of the silk weaving families of Kanchipuram. Neesa Arumugam has done tremendous work with this book. She is deeply enamored with sarees and with India. Her personal account threads through many wonderful photos, technical explanations, ornament references and historical anecdotes, lending it a playful and fun read. The book is published in India and not so well known in the west.